Today I made a new look for my website. It is the second changing since the fist look of this website was on March, 2011. The second theme I chose at this time is the Splendio Theme, which has a wider column, modern design with lines, clear fonts which are easy to read, and random cover photos. I have uploaded three different photos from the photo page, and they will randomly appear in this website. I received an email from Dr. James Ogburn, project manager of Thailand International Composition Festival 2012 (TICF) and also Chair of composition and theory at the Mahidol University College of Music, last Friday. He did lots of effort putting videos of every premiere piece in TICF on YouTube, including my piece. Thank James! By watching these videos it made me recall those days staying in Bangkok and in TICF. It was a wonderful experience to me. Although some problems occurred in rehearsing my piece, I still figured out the Thai musicians did their good job learning such a difficult piece in a very short time. 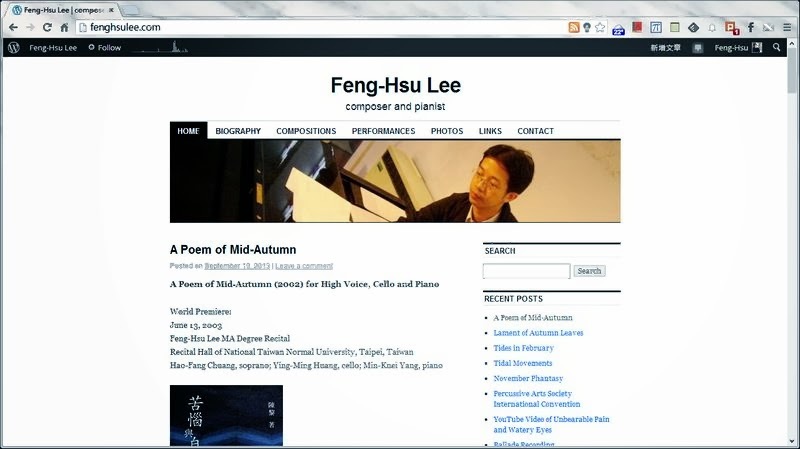 The video is a live premiere performance of my piece, Unbearable Pain and Watery Eyes for violin, percussion and piano, at the music auditorium (MACM Hall) of the Mahidol University on July 14, 2012. This piece is in memory of my beloved father. During the performance, I cannot help that my eyes became watery. After the performance, the musicians forgot to invite me to be on stage for showing I am the composer of this piece. But I really do not care for this. Somehow it seems that I saw my father bowing on the stage for me. I love my father forever! For more information of this piece, please click this link: Unbearable Pain and Watery Eyes. Today I have received a DVD sent by Sayun and Yu-Hao’s mom. The DVD is the live performance of Taiwanese Aboriginal Concert, which took place at Miaoli International Culture and Tourism Bureau Concert Hall (Taiwan) on July 8, 2012. Sayun asked me to compose a new piece for her and Yu-Hao to perform in this concert. Ballade (2012) for violin and percussion is the piece for this particular occasion. I regret that I was not available to attend the premiere performance because I traveled to Bangkok, Thailand for participating the Eighth Thailand International Composition Festival on that day. However, it is my pleasure to know that Sayun and Yu-Hao really did a great job for this piece by watching the DVD. I have posted the sound track of Ballade in this website, please click this link “Ballade” for listening the music and reading the performance notes. I have deleted the “Upcoming Performances” page, which is under the “Performances” page, few days ago. My plan is to combine the “Upcoming Performances” page into the “Performance” page, and add a new page. Today the new page I have added to this website is done, and it is the Chinese version of the “Performances” page. It took me very long time to translate the performance list into Chinese. Hope it helps for those who can read Chinese.